Dan Latham doesn’t embrace the 9-to-5 workday. By 4 a.m., the CEO of Pulse Medical Staffing is on the phone fielding calls from health care facilities. His company provides temporary supplemental staff and medical professionals to more than 300 hospitals and long-term care centers nationwide. The 48-year-old says he works 60 hours per week. But in reality, he is always on the clock. He prides himself on making good on his company’s motto of being “just a heartbeat away” from solving a client’s staffing problems. Long hours and a demanding schedule are nothing new to Latham. He graduated from the practical nursing program at St. Louis College of Health Careers in 1994. 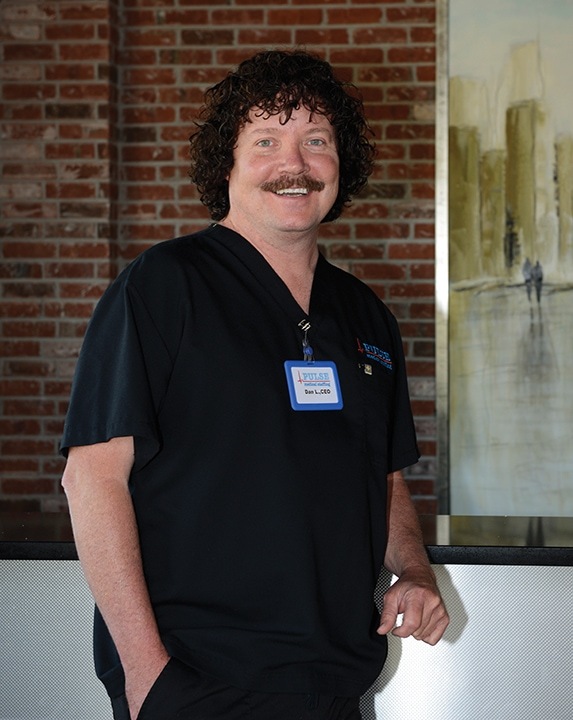 He has worked as an emergency medical technician, operating room technician, human tissue and transplant coordinator, and a licensed practical nurse. Latham was a traveling nurse for six years. That career gave him the opportunity to work in health care facilities in Florida, California, Texas, South Carolina and Washington. In 2003, the Sikeston native landed a travel nurse contract with University Hospital in Columbia. Latham worked there until 2007. His next job was as vice president of recruitment and hospital liaison for a local medical staffing agency. In the summer of 2010, Latham decided to open his own firm. In the last six years, he has grown his team of nationwide workers from less than 10 to more than 260. In 2012, the company’s revenues were around $230,000. Today, they are close to $1 million. Sales have grown nearly 100 percent each year since 2013. Just last March, the University of Missouri Extension Business Development Program honored Latham with its Rising Star Award. Latham credits many of his accomplishments as an entrepreneur to the experience he gained as a nurse. Professional mentoring has also contributed to the success of Pulse Medical Staffing. Before he started his company, Latham used the resources available through the BDP. Virginia Wilson, director of the local Small Business & Technology Development Center, has assisted Latham with all aspects of business development from market research and financing to writing a business plan and managing employees. The Missouri Procurement Technical Assistance Center is another BDP program that helps businesses win government contracts. Latham secured a five-year contract with the U.S. Department of Veterans Affairs hospitals with the help of MO PTAC counselors. One of those hurdles is the issue of cash flow. Latham says this is one of his biggest challenges. He pays his staff once a week, but hospitals pay him within 30 to 45 days, depending on the contract. Another challenge for Latham is finding enough temporary medical staff to fill the high demand. By 2025, the American Association of Colleges of Nursing expects that the U.S. nursing shortage will grow to 260,000 registered nurses. Latham says a single facility has requested as many as 25 nurses at one time. On occasion, he has gone back into the field as a nurse to help meet a client’s needs. Latham operates Pulse Medical Staffing from an office suite at 620 Trade Winds Parkway. He has an administrative staff of four people. They advertise the company’s services through word-of-mouth and social media, including Facebook, Twitter and LinkedIn. Latham and his employees provide 24/7 service and support to their clients. The company pays personal liability and offers basic life-support certification and renewal courses for medical professionals. When Pulse Medical Staffing employees report for duty, they already have the proper certifications, immunizations and workers’ compensation. Latham says he often goes above and beyond to ensure that his team of medical professionals has more than the minimum qualifications that the client requests. Latham says he sometimes misses the bedside interaction with patients that he had as a nurse. Yet, he has been able to find purpose in his role as a business owner. His mentor, Wilson, says Latham’s dedication to his staff is one of the strengths of his business. With so much time spent at work, Latham says the business can take a toll on his personal life. He remembers the year his son asked him to not answer his phone for the entire day as a birthday present. Although it is hard for him to leave the office, he made time for a vacation with his son to Yellowstone National Park last year. Despite the ups and downs of being a small-business owner, Latham says maintaining a positive outlook is essential.